I've been a LoveFilm customer for a number of years now and can honestly say the service has been getting better and better in the face of all the fierce competition from other similar online rental and streaming services such as Netflix, BlinkBox and numerous others. LoveFilm have really up'ed their game lately, especially with their online streaming service which I have found to be of excellent quality in HD through my Xbox or Smart Blu-Ray player. They have massively increased their selection of movies and TV shows, especially in the last month or two. They now include shows like Dexter, which I am quite looking forward to getting into now as well as shows like The Walking Dead, Californication, Nurse Jackie, Battlestar Galactica, Blue Bloods, The West Wing, Terminator: The Sarah Connor Chronicles, Nip/Tuck and 24 to name just few. Just lately I've been quite enjoying The US Office. The great thing about LoveFilm's streaming service is that it is completely unlimited; you can watch as many films or TV shows as you like, and it is a great experience to catch up on shows you might have missed first time round all without those annoying ad breaks. If you are thinking of trying LoveFilm then this is The Best way to do it. This code gives you 2 months FREE worth £29 and you can cancel at any time. 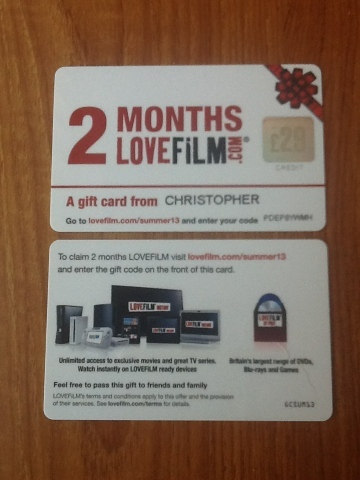 This is the best offer available for LoveFilm as most trials only last 2-4 weeks at most. What have you got to lose? As is usual for these kinds of offers, this is for new customers only and expires on 29th November 2013.